Growing up in the American household, for me, was not necessarily defined by the American Dream, but more at a story about a new ear of women. At a young age I was the man of the house, literally. I assumed responsibilities that most of my friends at that time, probably did not experience until they were in their teens. One might think that I was neglected of my childhood. I learned early on that we can tell the story of the lion or the story of the hunter. And, how does a cub learn to hunt or a bird learn to fly? You could say, I got a head start on the competition. Move forward to the scene of a single mother raising two boys on her own. No food stamps aka government assistance. No family members taking up the slack. No cheating the system for financial gains. No stellar collegiate education. What was very present was the will to make ways out of no-ways. Characteristics: Around 45% of single mothers have never married, around 55% are divorced, separated or widowed. Half have one child, 30% have two. About two fifths are White, one third Black, one quarter Hispanic. One quarter have a college degree, one sixth have not completed high school. Employment: At any one time, about two thirds of single mothers are also working outside the home, a slightly greater share than the share of married mothers who are also working outside the home. However, only two fifths of single mothers are employed full-time the entire year, and a quarter are jobless the entire year. Update: In 2011, there were 2.3 million women with children under 18 years old who unemployed, according to a recent report from the Labor Department. Single mothers account for more than half — 1.2 million — of the total number of unemployed mothers. So what's in it for a woman? How can she beat the odds? How can women of today renew their spirit, take on the task, and become women who now hire people to work at the businesses they started – women entrepreneurs? From my first experience, I saw my mother excel in every endeavor – Highest sales at New York Life Insurance. Highest sales at Mutual of Omaha Insurance. She received many accolades at United Airlines, held her real estate license in two states. She was a model, lead characters in plays, did a few commercials, started 2 businesses, took vacations to Jamaica, trips to London, Africa, Hawaii, and Europe, and always made sure her two sons attended the best schools in affluent communities. Now we're talking about a single black woman, which some might argue was a bit more of a struggle 40 years ago. Secondly, many of our clients at Oevae Marketing Consultants are owned by women. Now lets take a dose of reality. Most recently ,Forbes published an article Entrepreneurship Is The New Women's Movement, that says, "A quiet revolution is taking shape right now among women." These women have undoubtedly made stellar achievements, but what about the larger percentage of women? Where's the breadcrumb they can follow to success? It's called hard work, determination, willpower, education - Bethenny Frankel is a great example of all this and more. Today the Internet has flattened the educational boundaries, once reserved for those who could actually afford to be educated. The Internet has empowered more women to turn ideas into bank deposits and family vacations and penthouse apartments. Women have come from behind the curtain, tossed the iron and the ironing board, and become modern day Wonder Woman! Women have always loved a good conversation. It's been said that "conversation rules the nation" so it's no wonder at all that social media is a no brainer for women business owners. According to The National Federation of Independent Business (NFIB), Chase and the Center for Women's Business Research (CWBR), of those surveyed, 56% of women said social media is "very important" or "important" to their business. The New American Dream is becoming more and more like my childhood after all. I supposed my mother was also a visionary. She, like women of today, take the bull by the horns, squeeze lemons into lemonade, and make ways out of no-ways – The Wonder Woman In American Business. Making ways out of no-ways, I too have received many accolades and leading rolls while employed by VISA, Ticketmaster, Medieval Times, Kinkos – now FedEx Office, and now Head Honcho at Oevae Marketing Consultants for over 13 years. The post is being updated to include resources; Fund Your Business : How To Fund Your Business. Regardless of whether you are a seasoned leader or just beginning your career, this book is for anyone who desires to achieve success and significance. And secondly, there was an Christian Literary award given to a great book on the topic of business. 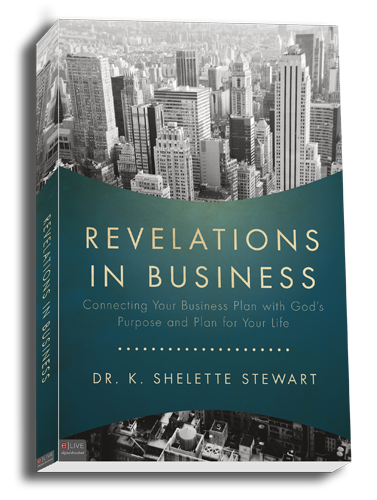 Revelations in Business, by Dr. K. Shelette Stewart. I highly recommend that you buy a copy of Revelations in Business. Inside, Dr. Stewart combines her core Christian beliefs with her extensive academic and professional experience with Fortune 500 companies, including The Coca-Cola Company, Hostess Brands, and BellSouth Corporation, to guide readers through an innovative 8-step Divine Business Planning approach that will position you to maximize your personal fulfillment and professional success in any industry. Revelations in Business is a powerful tool for progressive leaders who desire to bring insightful, empowering content to their teams to increase employee engagement, productivity, and overall profitability. – Dan T. Cathy, President and Chief Operating Officer, Chick-fil-A, Inc.